Welcome to the homepage of Protac Driver Backrest! We proudly manufacture a high-quality Driver Backrest for cruiser style bikes. Please note that our products are not intended for passenger use. 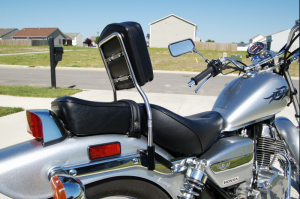 Visit our Products page to see if there is a Protac Driver Backrest available for your bike. Every backrest is specifically constructed to not only match your bike, but you as well. Placing orders: Fast eddy Sports is our authorized dealer for US and ALL International orders. We want our customers to be happy with our product so we have a money back warranty. If you are not happy with your Driver Backrest, just send it back within 30 days and we will refund your purchase price with exception of an $8.00 restocking fee. We no longer do alterations for fitment on these backrest, now we only give refunds. If you alter it yourself without contacting ProTac then the return and refund is null and void. We will not pay for alterations you have done by others. We will not pay for your time trying to alter this product.